Petra, famous for its hundreds of rock-cut tombs, was a great trading centre of the ancient Arabs on the edge of the desert. 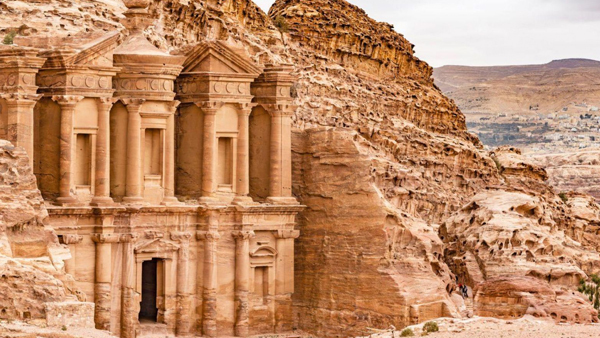 This lecture will use the archaeology, architecture, and art of Petra to reconstruct the trade routes, the technology, the everyday life, the hybrid culture, and the death rites of the Nabataean Arabs who occupied the city. We will discover a city on the edge in every sense – standing between desert and cultivated land, between nomadism and civilisation, between Middle Eastern culture and Graeco-Roman classicism: an exotic Oriental mix in a stunning mountain landscape. Dr Neil Faulkner was educated at King’s College Cambridge and Institute of Archaeology UCL. He works as lecturer, writer, archaeologist and occasional broadcaster. Research Fellow, University of Bristol. Editor, Military History Monthly. Director, Sedgeford Historical and Archaeological Research Project. Director, Great Arab Revolt Project. Author of The Decline and Fall of Roman Britain, Apocalypse, Hidden Treasure, Rome: Empire of the Eagles, and The Ancient Greek Olympics: a visitor’s guide. Author of forthcoming Lawrence of Arabia’s War. Major TV appearances include Channel 4’s Time Team, BBC2’s Timewatch, Channel Five’s Boudica Revealed and Sky Atlantic’s The British.